FullHD UV 385nm LED Light Engine with internal radiometer. In order to maintain optimum printing quality, it is necessary to supply exactly the same amount of UV energy dosis on each layer. Other printers in the market that include LED projectors are not able to keep this constant energy throughout the same print, causing surface irregularities and artifacts. In addition, within some hours of use, the LEDs tend to lose intensity, needing constant adjustments in the material profiles. Thanks to its Solid State light engine and FullHD (1920×1080 px) DLP projector, the new Microlay Versus Dental 3D Printer is able to print to an amazing resolution of 65 microns in the horizontal XY plane and 50 microns in the vertical Z plane (up to 10 microns). The degree of detail and reliability is astonishing and the surface finish is simply spectacular. Open to third party materials. The 385 nm UV light source guarantees compatibility with most of the premium dental resins in the market, including white and clear resins which are problematic with other printers with visible light projectors. Don’t let anyone tells you which material to use, choose the one you like. We know that within certain sectors, such as dental or scientific research, not only precision but also predictability and repeatability are essential, and although we often find 3D printers in the market that are capable of achieving good results, we find the problem that these results are not always repeatable due to the large number of variables that can affect the success of an impression such as the orientation, its location in the tray, the correct generation of the supports, the ambient temperature and most importantly, the small deformations caused by an optical module that is not up to the demands or a poor mechanical design. Details are very important for Microlay, which is why we take extreme care with the design and finish of every part of the machine, especially those that will come into direct contact with the user. We have chosen aluminum with a nice anodized finish as the material for both the printing surface and the bucket. This minimizes the natural wear of the parts in contact with the resin, and enables considerable savings on replacements. We have heated the printing chamber using hot air by convection, this way we managed to create the optimum microclimate for each resin, reducing its viscosity and reproducing a controlled environment that ease the repeatability. We are aware of the importance of time saving and comfort in day-to-day life in dental labs and clinics. Microlay Versus works as a Printing server and includes a web interface so you can monitor and control absolutely everything through your PC, Tablet or Smartphone from wherever you happen to be. Send a file from the computer where you have installed your CAD/CAM software remotely using local Wi-Fi. You can even ask for remote support using its built-in TeamViewer app. Microlay Versus is meant to make difficult jobs easy. Among other features, it has a big 7″ touchscreen with a clean and intuitive interface for handling routine procedures. Load the digital file (STL, SLC, ZIP), select a profile to match the resin that you are going to use, then go ahead and print. It’s that easy. Another convenient feature is the monitoring camera placed below the bucket so you can keep a constant check on what’s going on. Print surgical guides from your clinic. Some resins such as Detax Freeprint Temp or Nextdent C&B allow you to print temporary biocompatible bridges and crowns that can be left in the mouth for up to a month and can even be color matched. 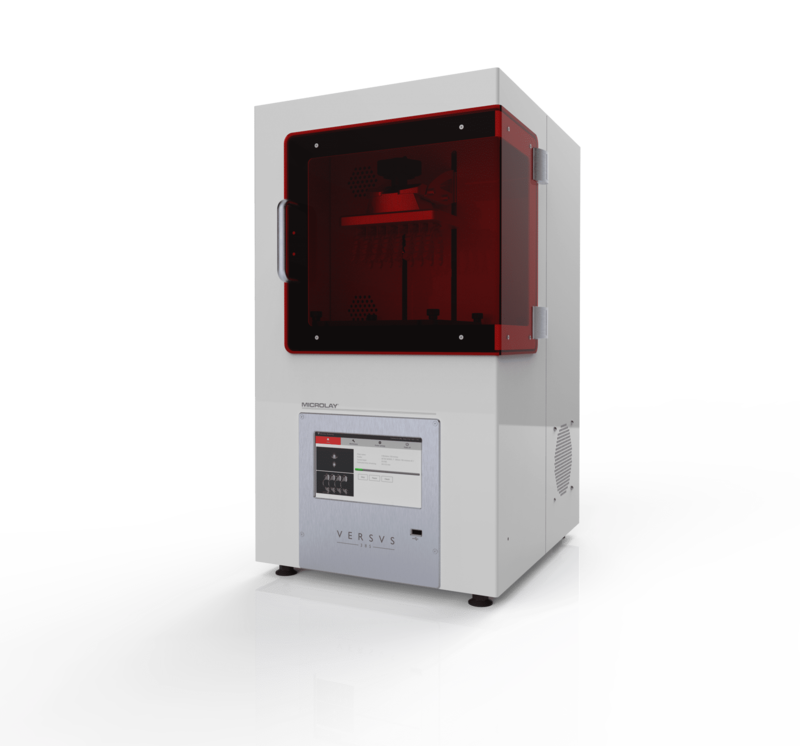 Print up to 8 models at once. Microlay Versus is compatible with a large number of resins including the NextDent, Dreve, Pro3dure or Detax ranges. Print digital dentures in minutes with the Microlay Versus, forget complicated processes, just design and print. No more thermoforming, just scan, design and print.